Ok, for a change let's check out how the freestyle stroke is NOT supposed be done. In this post, I will examine a short video where you will see a front view of a freestyle swimmer who is swimming against the current in a small swim flume (endless pool) which is then shown on the image at the end of the post. 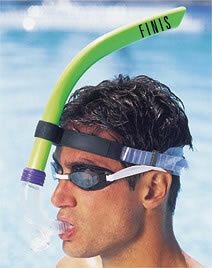 These endless swimming pools are quite nice, especially if combined with a front snorkel depicted in the second picture. This way you could practice a perfect freestyle swimming stroke without being distracted with flip turns or breathing. However, Let's get back to our front view freestyle video analysis. I am not sure who this person is, but I'll point out a few obvious bad mistakes he is doing, so perhaps he will appreciate this review. First, play the video all the way through and then play it again and try to figure out yourself what he is doing right and what he is doing wrong. Then click below to see the entire post to see if you correctly identified some of the most common freestyle stroke technique mistakes. 1.) Why is he looking at the camera? His eyes should be pointing toward the bottom of the pool and his neck should not have any wrinkles. Why do you need to look down? The answer is simple, to keep your feet elevated and therefore having less resistance when you swim through the water. More information can be found in the body position post. 2.) Imagine a line going through his body which would split him in two halves (right and left). Now check out his hands and where they enter into the water. The hands should never reach over to the other half (passed the axis). This causes the swimmer to snake through the water instead of going in as streamlined of a position as possible. 3.) From our view, the left hand is tilted with the palm out when it enters the water. That shouldn't really happen. He could catch a lot more water if he would point his palm more toward the bottom of the pool. Also, such a hand entry is the major cause of shoulder injuries, so be careful here. 4.) Stretch, stretch, stretch. Check out how on some of the strokes his elbow is still bend and he is already starting a movement through the water. He should reach forward as far as possible to find his catch and roll a little more to each side in order to achieve this. On the other hand, notice how he is keeping his head steady and only the sholders rotate, this is a very good indication of a correct freestyle stroke. 5.) I'd also like to point out that the hand on the left from our view, when in the water, goes too far to the left when grabbing the water. He should concentrate to go more under his body with his arms, thus putting less stress on his shoulder and being more streamlined. I am sure you can think of a few more things that are wrong with the video. Please don't be shy to share them with me on the comments section. To get you started on your way to effortless and efficient swimming, check out the introduction to better body and head position in the water while swimming freestyle. this is nice. Id like to have one of those to train in. I have seen the one in colorado... and they can set to a pase. had a guy go 45 sec 100m pace and he completed for 30sec or something like that! I would say that sometimes his left hand entry is going in with his arm completely extended. If he shortens it up and enters with his elbow bent and THEN extends his arm completely, air bubbles will not be stuck on his hand as he pulls. Other times the entry is to far across his body. I agree: he should also adjust his hand possition to catch more water. one major error...his palms r open. according 2 me d fingers must b close 2 each other so u can push more water. in this video d fingers r open so lot of water passes frm between. I agree with the "fingers slightly open" technique. I find it much easier to pull the water back if my fingers are a bit open. there is one thing I would like to ask you . When my arm enters the water it is straght and not bent at the elbow as it should be. I loose all rythem if I bent my arm. How should I counter this problem? Thanks for the tip. I will try to correct my flaw. As his left hand enters the water he lifts it up forcing the elbow down. This ensures he has very little catch at the beginning of his stroke as he has to push down first. This uses a lot of wasted energy and is not efficient. Also agree fingers are too wide open, but this is less of a problem than his initail catch phase. @Tony: thanks for the good comment. Ahh, the mystical front catch :), so simple in theory, so complex when put in practice. If you are wondering what Tony is talking about check out this post about early catch in freestyle. Having a large swimming pool is great for swimming exercises. These are great tips and will help with my routine.